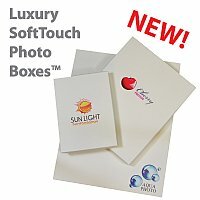 Wildcat offers an exclusive line of luxury Soft Touch Photo Boxes™ for studios with the most lavish taste. This exquisite package is USA made with only the best USA made materials. Our White Soft Touch outer coating has a sleek velvet touch and plush appearance. Our extra thick, heavy white cardboard inside gives this top shelf photo presentation box a sturdy, trusted photo presentation. Inside and out, this presentation is simply luxurious. most gorgeous, exclusive, and elegant photo presentation that projects your studio’s brand. Offer clients prints in a presentation system that compliments and showcases your hard work and attention to detail.